If you’re on the lookout to transform your garden and outdoor space, the landscaping & architecture department at Polhill Garden Centre in Kent stocks a range of products that are ideal for you. With a range of garden sheds and buildings available, your garden and patio area can be the envy of all your friends and family. 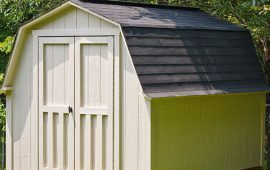 Whether your garden is big or small, we have some fantastic landscaping and architecture products available including garden buildings and sheds. If you’re in need of some help or advice on what would suit your gardens size, our expert team will be more than happy to give you a hand. You can make the most out of your outdoor space with the fantastic range of garden buildings available at Polhill Garden Centre in Kent. The summer months will be transformed with the help of a wonderful summerhouse or building, whilst allowing you to use your garden and outdoor area right through the winter months, too. Our superior quality summerhouses are ideal for those with larger gardens looking for an ideal place to spend hot summer evenings or cold winter nights. If you need some extra help and advice on which of our garden buildings would work best in your garden space, the expert team at Polhill Garden Centre will be more than happy to help.